it all happened on a dark Sunday night. The Kannada screen idol Rajkumar was in Doddagajanur village in Erode district, Tamil Nadu, for a house-warming get together with his family and relatives. The bandit was on the prowl. Before anyone knew what was happening, he had whisked away their dear anna veru Rajkumar and three others. Rajkumar let him be led "harmlessly". There was no real life daredevilry so characteristic of Veerappan that accompanied the eight-minute drama (from 9.30 pm to 9.38 pm) on July 30. When the news broke, Karnataka was drowned in tears larger than the monsoon raindrops. 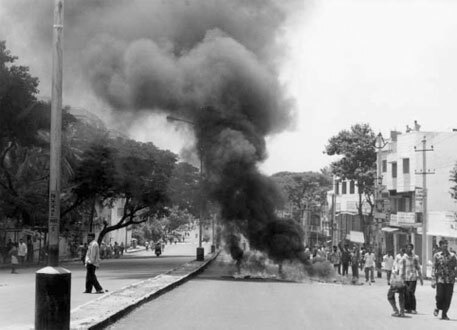 Riots broke out with demands to save anna veru (elder brother). Every one waited with baited breaths for some news from their matinee idol - a cult figure in the southern states. The news came, a day later. It was Rajkumar's voice pleading Veerappan's case with the governments of both Tamil Nadu and Karnataka. Soon after, he put across his demands: 10 in all ranging from setting the Cauvery dispute to release of his colleagues and installation of Tamil sage-poet Thiruvalluvar's statue in the Silicon City. 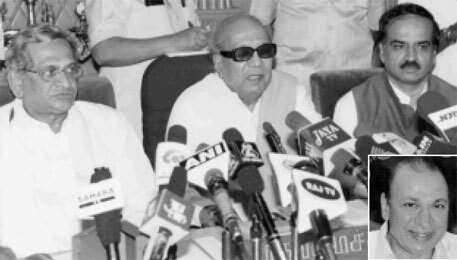 Ever since, chief ministers S M Krishna and M Karunanidhi of Karnataka and Tamil Nadu, respectively, have held frenetic meetings to find a way out of the crisis. They have sent their emissary R R Gopal, editor of Tamil bi-weekly Nakkheeran and who mediated during the 1997 hostage crisis, to mediate on their behalf and find the reasons behind his 'yet another' daring move. Has the tough life in the jungle begun to eat into the bones of the ageing bandit? Is sandalwood smuggling no longer lucrative? Will he surrender given the high profile of his hostage? Is he seeking amnesty? There is a lot in stake for the man responsible for 120 human deaths, including 32 police officials, and 2,000 elephant deaths, besides a plethora of crimes. The state governments' stake, too, is on a higher ground. By triggering a linguistic divide between the two neighbouring states, the entire saga has now taken strong political connotations. The much cited reason for Rajkumar's abduction by Veerappan is "jungle fatigue" and age (estimates about his age vary from 54-60). But another, and more important reason, cited by forest officials and the local people - living in the 8,000 sq km area which covers the states of Karnataka, Tamil Nadu and Kerala from where the bandit operates - is depletion of sandalwood forests. In fact, in the last one year, the Special Task Forces (stfs), set up by the Karnataka and Tamil Nadu governments to track the bandit, have not seized any major consignment of sandalwood from Veerappan's gang. 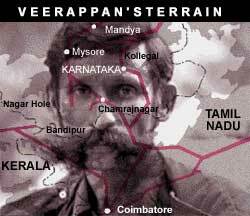 "Ten years ago, Veerappan made an average of about Rs 50 lakh each year. But in the last five years, his turnover has come down to a few lakh rupees. We have not observed any fresh felling of sandalwood trees in the region," says a high-level official the Karnataka stf on conditions of anonymity. "Of late, I have not heard of sandalwood smuggling by Veerappan," says E M Annaiah, deputy conservator of forest, Bijapur, Karnataka. According to Karnataka forest records, between 1996-1999, the seizure of sandalwood had gone down by 50 per cent in terms of their worth. Between 1996-97, the value of seized sandalwood was Rs 139.96 lakh. Now it has gone down to Rs 72.66 lakh. However, according to forest officials, there has been no lull in smuggling operations. In fact, due to non-availability of mature sandalwood trees, even 8-10 years old trees are being felled. Hence, their worth decreases. "It is now rare to find a sandalwood tree 50 cm girth," says T S Rathore, a bio-technologist with the Institute of Wood Science and Technology (iwst), Bangalore. Sandalwood trees used to grow like a weed in the forests of south India, but now it has become rare. As one travels from Bangalore to Mysore and then towards Veerappan's stronghold of Kollegal forest range, the density of trees becomes sparse. "There is a remarkable depletion in the density of sandalwood trees in the forest," says C Srinivasan, deputy conservator of forests, Mysore. About 5-8 years ago, the central sandalwood godown in Mysore used to get 100-200 tonnes of sandalwood each year. Now it has come down to a paltry 30-40 tonnes, which includes the seized sandalwood. The scarcity is such that it has triggered a "bloody" war among different sandalwood smuggling gangs. In Tamil Nadu, around 70 per cent of the seizures have been made after tips from rival gangs. Another indication of the scarcity is the sandalwood carving market of Karnataka. Once famous for its sandalwood carving, the state is now switching to alternatives like rosewood. "We need mature and good quality sandalwood, but there is a slump in the market," says Abdul Riaz, a carver who used to earn Rs 25,000 each month in the 1980s. "Profit has gone down as the cost of sandalwood in the black market is very high. I hardly earn Rs 15,000 now," he says. Though the forest offices of both states do not have any record of sandalwood tree depletion, some research papers offer insight. At an international seminar on sandalwood organised by iwst , experts warned that sandalwood forests need immediate attention as they are not only being subjected to rampant felling by smugglers, but also a disease called "spike" is killing thousands of trees. "Though sandalwood trees regenerate very quickly, the rate of felling is so high that we have been left with stumps only," says S Murugesan of National Tree Growers' Cooperative in the Kolar district. Recent figures of the Karnataka forest department show that the stock and yield of sandalwood has been declining since the early 1990s. What supports the trend is the reduction of both extraction and seizures of sandalwood: in 1991-92, the Karnataka government extracted 382 tonnes of sandalwood and seized 591 tonnes of it. In 1996-97 it dropped to 225 tonnes and 78 tonnes respectively. Apart from rampant smuggling - which allegedly thrives because of a nexus between politicians and smugglers - the reasons for this depletion are forest officials cutting young trees to be transported to the godown in the fear that the smugglers would cut them and the lack of people's interest in protecting these trees as forest laws prohibit private cultivation or nurturing of trees in private lands (see box: Forest outlaws ). Archaic forest laws will only produce more Veerappans According to laws in both Tamil Nadu and Karnataka, a sandalwood tree is a state property and the government has exclusive rights over its harvest, selling and movement. “Since local people do not get any benefits from these trees, they do not take interest in its protection,” says Madhav Gadgil who is with the Indian Institute of Science, Bangalore. In Bangalore, many people have uprooted small sandalwood trees. What happens when a tree matures? If the forest department doesn’t harass you, the smugglers will raid you and as a result of it you would be held responsible for it by the forest department,” explains a scientist of the Institute of Wood Science and Technology. Tamil Nadu and Karnataka together account for 90 per cent of India's sandalwood tree growing areas. Kerala, however, which has some sandalwood forests, does not have any regulation on it. It is not surprising, therefore, that there are an estimated 40 sandalwood oil distilling units located in the Kerala-Karnataka border which thrive on smuggled sandalwood from these two states. Interestingly, to supply these distilling units with sandalwood, the markets in Kerala offer twice the price of that of the Karnataka government. Another reason for smuggling is that the government buys sandalwood at a very cheap rate - Rs 1.44 lakh per tonne - while in the black market the same wood fetches around Rs 4 lakh. Similarly, for the private owners of sandalwood trees, Karnataka government pays a royalty of 70 per cent of the cost of the tree and the owner gets his share only after a long bureaucratic procedures. "This definitely discourages private owners to have any trees in their premise," says a forest official posted in Kollegal. Ironically, the worst victim of these stringent regulations is the forest department itself. With the realisation of the price of the wood in the black market, forest dwellers are flocking to smugglers rather than the forest department. In Karnataka, where sandalwood used to once provide huge revenue to the forest department, now gets more revenue from fuelwood and charcoal than sandalwood - it earns Rs 925.34 lakh from fuelwood and charcoal and Rs 597.16 lakh from sandalwood. In all this, the governments of both states have little interest to deregularise the trade in sandalwood and to encourage private cultivation. Although some feeble attempts have been made, nothing has materialised. The Karnataka government has prepared a draft on allowing more private cultivation with an objective of increasing the area of sandalwood trees. This draft has been placed before the state cabinet. In 1997, the Tamil Nadu government showed some interest to deregularise it, but till now nothing has materialised. Says G Sanathanakumar, a professor at Hindu College in Nagercoil, Tamil Nadu: "The Tamil Nadu government has not deregularised the trade in sandalwood. "Rather, it is putting additional control over it." "Unless local communities are given the benefits, can there be no regeneration," says Madhav Gadgil, an ecologist with the Bangalore-based Indian Institute of Science. "The whole forest management has to be changed. This faulty management has alienated people who, in turn today, support Veerappan as a saviour." In fact, due to this restriction and the scarcity, India is losing its international sandalwood market. Recently, Indonesia launched a massive sandalwood plantation programme aimed at capturing the international market where there is a huge demand for sandalwood. Similarly, China and Japan, two of India's buyers of sandalwood, have also taken up plantation activities. Unless authorities in India amend the archaic forest laws and make people equal partners in the regeneration programmes, criminals like Veerappan will continue to plunder India's forests. Why is Veerappan popular with the residents of some 175 villages from where he operates? Simply because he not only gives them employment, but also facilitates smuggling of small amount of sandalwood in the nearby Salem market in Tamil Nadu. Considering that he has not been actively involved with smuggling of sandalwood in the last one year, he now encourages local people to sell a few kilogrammes (kg) of the wood in the local market. “Veerappan has taught the people the value of the wood,” says a programme officer of a non-governmental organisation (NGO) based in Mysore. Earlier, the local people were scared of taking up this activity, but once Veerappan gave them protection it has been easy for them to smuggle between 5-10 kg of sandalwood along with other minor forest produce for sale. This is a common sight in Thaliwadi in Tamil Nadu’s Erode district. “Of course, forest officials are paid bribe and usually they don’t catch the local villagers because of the fear of Veerappan,” says the programme officer. “Now people are using Veerappan’s name to threaten forest guards,” says a forest range officer. For the local inhabitants of the forests, Veerappan gives money for identifying and cutting sandalwood trees. According to forest department sources in Mysore range, he pays Rs 10 identifying and Rs 25 for felling a tree. On an average a person can earn around Rs 100 per day. “His Robin Hood-like image is true in these villages,” says a student of Tamil Nadu Agriculture University who is doing research on forestry in all these villages.